I didn’t read this book nor watch the movie before, and now that I got the chance to read it, I honestly love it! The story is so magical and lovely. I love everything about this book. I like the flow of the story, I love how the main character learned from his lesson. It’s really perfect! I like it so much. I wasn’t thinking of simple YA, I’m just so happy it’s a fantasy! It’s been a long time since I’ve read this kind of book genre. It’s from Beauty and the Beast right? I love that fantasy, and this is a good recreation, I don’t know how you are going to put it or describe it. It’s really an awesome book! And I watched the movie last night, and it’s far from the book but then I still like it. Kyle Kingson is a rich, handsome man, heartthrob in the whole school but the catch? He’s boastful. Even if he’s a rich kid, his father don’t talk to him that much because of work. His dad is a workaholic man, always on a phone and all that. He met Kendra, a woman who taught him lessons. Kendra punishes him, gave him a curse that no one can cure unless someone love him and kiss him. Kyle did everything until he almost give up and try finding the girl who can love him despite of his ugliness. He remembered this girl who he met in the ball namely Lindy. Not so long, he fell in love with this girl and hoped build up inside him, she may be the key for him to transform in his old self. Fantastic and magical! I will never get tired reading Beastly, I might re-read it again soon! And watch the movie over and over again. It got hooked in everything, how love creates a new self and change your life. The movie is different though, I expected it to be like the book too coz I was wondering how are they going to make it, well, I could say it’s not bad. Some of the highlights are still there, and story between Lindy and Kyle in the movie is so cute! Hunter huh? Not bad. Anyways, Kyle is so cute in the movie! The book is so good, after reading the book, I promised myself I’ll but another Alex Flinn book and hopefully there’s another movie. I was born in a log cabin in the Big Woods of . . . okay, maybe not. I was born on Long Island, New York. When I was five years old, my mom said that I should be an author. I guess I must have nodded or something because, from that point on, every poem I ever wrote in school was submitted to Highlights or Cricket magazine. I was collecting rejection slips at age seven! I learned to read early. But I compensated for this early proficiency by absolutely refusing to read the programmed readers required by the school system -- workbooks where you read the story, then answered the questions. When the other kids were on Book 20, I was on Book 1! 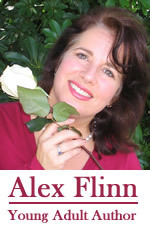 My teacher, Mrs. Zeiser, told my mother, "Alexandra marches to her own drummer." I don't think that was supposed to be a good thing. Now, when my daughter, Katie, brings home FCAT prep materials where you are supposed to read a passage and answer questions, I want to ask the teacher, "Does she really need to do this? She can read!!!" My family moved to Miami when I was in middle school. I had a really hard time making friends, so I spent a lot of time reading and writing then. But unlike Christopher Paolini or Amelia Atwater-Rhodes, I never finished writing a novel. That was also when I learned to be a keen observer. By high school, I'd made some friends and gotten involved in various "gifted and talented" performing arts programs. I studied opera in college (I'm a coloratura -- the really loud, high-pitched sopranos.) and then went to law school. It was law school that probably helped with my first novel. Breathing Underwater deals with the serious and all-too-common problem of dating violence. I based the book on my experiences interning with the State Attorney's Office and volunteering with battered women. I thought this was a really important topic, as 27 percent of teenage girls surveyed have been hit by a boyfriend. I'm happy that the book is so popular, and if you are reading this bio because the book was assigned for school, I'm happy about that too. I started writing an early (and laughable) version of Breathing Underwater in college (I was really bored on a car trip with my parents). I didn't get back to it until I had my first daughter, Katie. I'm self-taught. I went to the library and took out books on writing. Then, I read a lot of young-adult novels by writers I admired, particularly Richard Peck. Reading his books is like listening to Mozart -- you learn the right way to write a novel. Then, you fill in your own style. I actually got to meet Richard Peck in person at a workshop of the Key West Literary Seminar. Lots of writers have been really helpful to me, especially Richard and fellow YA author, Joyce Sweeney. I think I write for young-adults because I never quite got over being one. In my mind, I am still 13-years-old, running laps on the athletic field, wearing this really baggy white gymsuit. I'm continually amazed at the idea that I have a checking account and a mortgage. So I try to write books that gymsuit girl might enjoy. It's a way of going back to being 13...knowing what I know now. Right now, I live half a mile away from my old middle school, in Palmetto Bay, a suburb of Miami, with my husband, Gene, and daughters, Katie and Meredith. 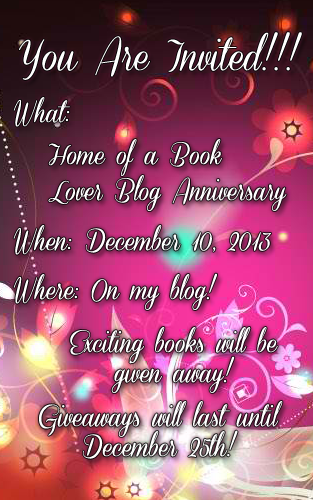 -- Before I end this review I want to invite all of you to my upcoming blog anniversary! It's December 1 here in the Philippines so basically it's 9 days before my blog anniversary! !